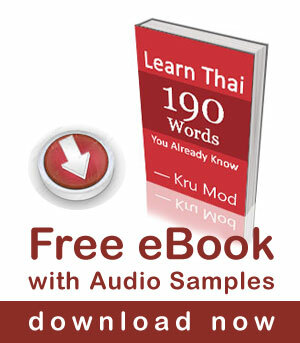 Sà-wàt-dii is the greeting word that everyone will hear wherever you go in Thailand. The word is spoken with the Wai, indicated by pressing your palms together near your chest and bowing. The word is also spoken as a farewell as well. Sà-wàt-dii is always added by polite particles to show respect to the adressee. The most common are ‘kráp‘, used by males, ‘kâ‘ used by females. I got questions from my students many times that what they should do when being wai-ed to. You would be considered impolite if you didn’t return or at least acknowledge the wai. At the very least, you can smile and nod. Only monks and royalty do not need to return a wai.